Island Estates is part of Hammock Dunes, certainly one of the most attractive and premier communities in all of Florida. Hammock Dunes includes 7 magnificent mid-rise ocean front condo buildings, numerous low-rise condos, a variety of villa communities, hundreds of single family homes including ocean front houses and lots, and our favorite place...Island Estates. All property owners have the option to purchase an equity membership in The Hammock Dunes Club, with two spectacular clubhouses servicing our two golf courses. The newly remodelled main clubhouse is 32,000 sq. ft. that sits directly on the ocean with nearly every amenity you might wish for, including both casual and gourmet dining, a huge swimming pool, a new fitness center, incredible ocean views, beach access, impeccable croquet courts. The second one is a more intimate low country-style clubhouse nestled in nature. The staff at both are courteous, efficient and always have a cheerful smile. And then there are the twin jewels of Hammock Dunes that these clubhouses serve...our two world class golf courses...The Tom Fazio designed Links Course, and The Creek Course designed by Reese Jones...both providing some of the most satisfying and enjoyable golfing you may ever experience. The Links with it's distinctive terrain and ocean front challenges. 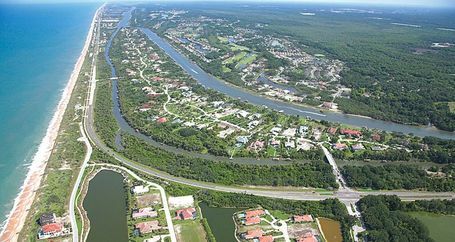 The Creek secluded in nature, no homesites, just golf, nature and views of the Intracoastal waterway. If 36 holes of challenging and magnificent golfing appeals to you, then you will love Hammock Dunes and Island Estates. 4 BR / 5.5 BA / 6220 Sq.Ft.